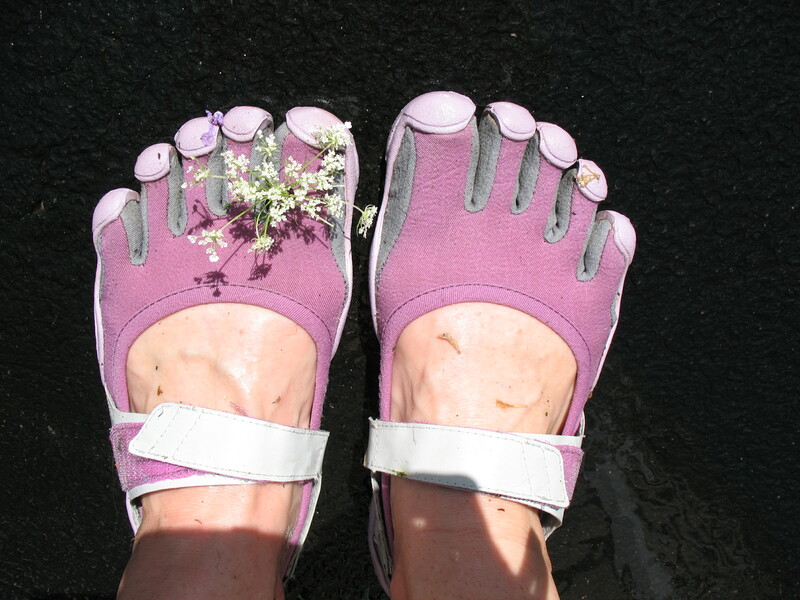 One of the perks of the Vibram Five Fingers. . .
You’re not just running: you’re also picking flowers! Which reminds me, here’s a local photography blog with a simple-but-satisfying Queen Anne’s Lace Project. And as long as we’re talking local blogs and craftiness, here’s a blog about family fun in the Adirondacks with a cool window star craft. Actually, I ran into a friend at the pool today who accused me of rolling my eyes at her. I was sure that she was wrong until I realized when: she’d stopped her car and waited for me to run in front of her. I know it’s wrong, but this is one of my pet peeves. When people stop I feel like I have to speed up and get out of their way, when I just want to maintain my pace. It’s not like it’s so busy around my neighborhood that I have to stop for cars much at all–usually I can just postpone crossing the street or I’ll even jog in a little circle. And she had stopped, feeling bad for me because I’d been “caught” in the rain. When, actually, I went running because it was raining. Rain might be my favorite running weather. So, I’m sure that I did roll my eyes at her. I’ll have to try to be less obvious in the future. For more of our adventures at the pool, you can check out the CBS 6 Blog, too. 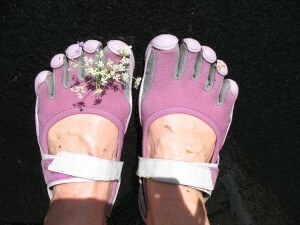 love the vibram 5 fingers shoes – they are super comfy and supposed to be good for your balance!! People give you funny looks though! Hi, thanks so much for the mention. I’ll share this activity – we went to Ghent one day last week, down route 9H and made a stop at Loveapple Farms and then 2 miles away to The Fields -the sculpture garden at Omi Art Center. It was a great combination of farmstand (you can pick your own or purchase at the market including cider donuts) with petting zoo, then walking through the amazing sculptures.